Monreal London sport skirt with ombre tie-dye trim. Approx. length: front, 13"L from waist to hem; back, 14"L from waist to hem. Sits just below natural waist. Ruffled trim; slightly pleated skirt. 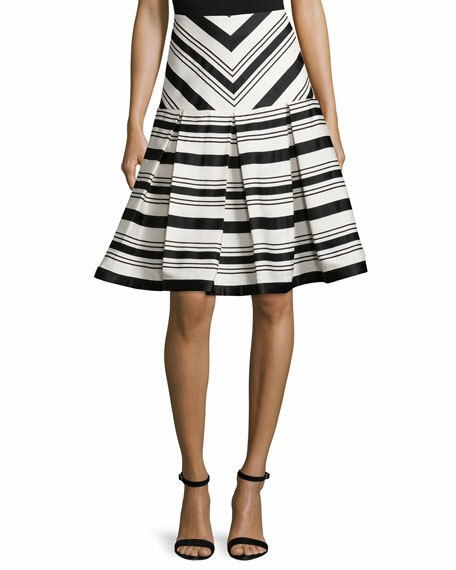 Alexis "Emmerson" textured skirt in two-tone stripes. Sits at the natural waist. Fitted through thighs. Box pleats create full skirt. Hem hits knees. Hidden back zip. Viscose/polyester/nylon. Lining, polyester/spandex. Imported. 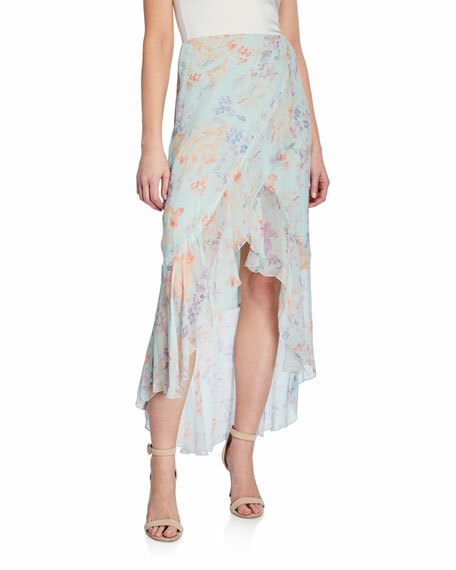 Alice + Olivia "Caily" skirt in floral-print. Straight silhouette. Draped wrap front. High-low flounce hem. Midi length. Back zip closure. Viscose; polyester/spandex lining. Made in USA of imported material. Tory Sport performance golf skirt. Built-in breathable inner shorts. Interior elastic waistband. Side zip pockets. A-line silhouette. Back scorecard pocket. Embroidered logo patch. Mini length. Pull-on style. Polyester. Imported.